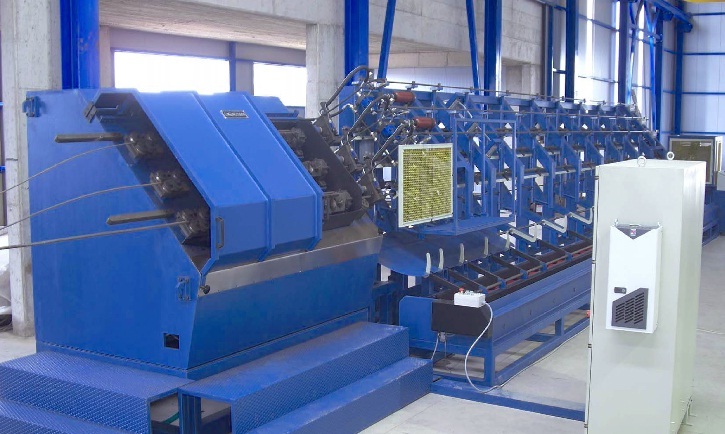 Among our rebar processing equipment, a complete range of high-speed programmable and flexible single line and multi-line straightening & cutting machines (type MELC) are offered, able to cover every production demand for heavy duty and continuous operation within the reinforcing industry. The straightening method adopted is based on the Rotor straightening principle, introduced by EUROBEND GmbH engineers in the early eighties. b) Conventional Rotor straightening with dies. The advantages and disadvantages of the systems are known, mainly the first does not produce quality straightness and damages the re-bar surface with extreme pressure on the re-bar, while starting and stopping for cutting, and the second generates too much heat, due to friction, that reverses any good straightness produced at the rotor and damages the re-bar surface. Our method is based on the Rotor straightening system, but instead of dies, we have placed hyperbolically profiled steel rollers. The cylinders execute the two (2) fundamental operations of straightening and feeding simultaneously. This is achieved by positioning the cylinders at an angle to the re-bar and rotating them round the re-bar, so at the same time accomplish feeding and straightening. The placement of the rollers at an angle to the re-bar axis, results in line contact with the re-bar surface and not point contact as in conventional rotors. Also, when the Rotor is spinning and the rollers are feeding the re-bar through, there is no sliding friction -only rolling friction- thus the re-bar surface is not damaged. Our straightening method ensures better straightening quality and consistency, which is something that can not be found in the competition, since continuous wear of the dies, or the conventional rollers, can not be avoided. Machine downtime is minimized, since continuous adjustment of the straightening mechanism is not needed. Straightening of high tensile steel (up to 1800 N/mm2 UTS) has been achieved and the difficulties were overcome easily with less expenses. Mechanical simplicity of machine construction, due to the simultaneous feeding and straightening, results in a machine with stable, constant and continuous operation. 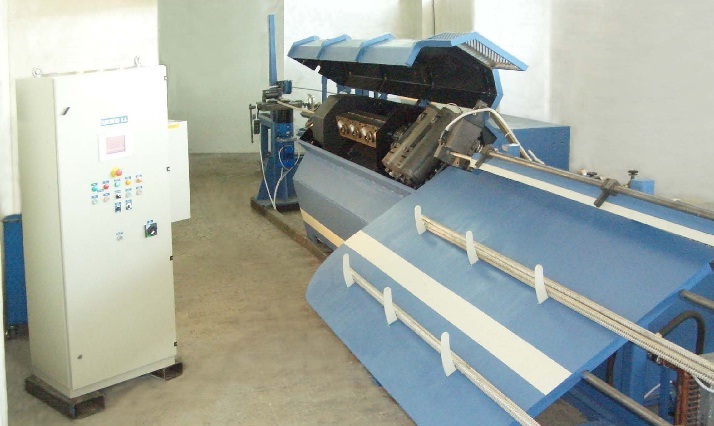 Cutting of the required length is achieved with flying shear cutter, while the re-bar is moving, without having to start and stop, or to slow down the speed of the re-bar, in order to cut. The simplicity of the design allows the construction of multi-line machines (up to six Rotors) depending on the productivity requirements and the diameter ranges of each customer. Each line works independent from the others and any combination or all of them can work together. Each has a dedicated collector bin and can cut the same or different lengths. By designing the right hyperbolic profile (curvature) of the roller, combined with the proper surface treatment of the roller and more rarely the proper coating, we can achieve the desired surface finish on the straightened re-bar surface. Each rotor usually is pre-set for working with one (1) up to four (4) different diameters, according to the customer productivity requirements. With multi-Rotor configuration machines production speeds of up to 500 m/min have been achieved. Single line straightening and cutting machines, capable of achieving speeds of up to 120m/min. Speed is adjusted by Frequency inverter controls, thus the machine adapts the output to the required productivity needs, where at the same time parts life cycle maximized and downtime minimized. Coil diameter changes can be achieved in less than five minutes due to the special preset system used. There are special application modules available, for rebar twist control and surface finish control (PATENTED) making the MELC monocline series ideal for high tensile (or stainless steel) rebar straightening. Automatic Re-bar STRAIGHTENING & CUTTING MACHINE, processing up to six (6) interchangeable coils. All MELC FLEXILINE straightening & cutting machines are equipped with our unique convergence guide system for automatic re-bar diameter/coil changes in less than 2 seconds (patented). The extremely fast and automatic coil changes, enables the production of different re-bar diameters in the same batch without complicated collection systems. A flying shear cutter, common to all lines, allows uninterrupted operation and minimizes material stresses. Equipped also with Industrial microprocessor controls and user-friendly operation using advanced Windows based software. The MELC FLEXILINE straightening and cutting machines are available in various multi-line configurations, from three up to six lines, processing re-bar sizes from 8mm up to 20mm #3  #6. The MELC MULTILINE series of straightening & cutting machines are designed for high output continuous operation within the reinforcing industry. Each rotor (line) works independently from the others, thus each line can operate with the same or different re-bar diameter and cut the same or different length. One up to six straightening rotors (lines) can be combined on the same machine. Production speeds up to 500 m/min (1650 ft/min). Any size of straightening rotors from Ø4mm to Ø20mm (1/6 to 3/4) can be combined to form a multi-line machine. Flying shear cutters cut the straightened re-bars, while in motion, thus allowing uninterrupted operation, minimum material stresses and ensures no marking on the re-bar surface. Each line has an independent collection system and leads the re-bars to a common collector for all the lines for bundling without interrupting machine operation. Various material handling systems such as roller, pocket and transfer conveyors can be combined with automatic bundling and pocket storage units. 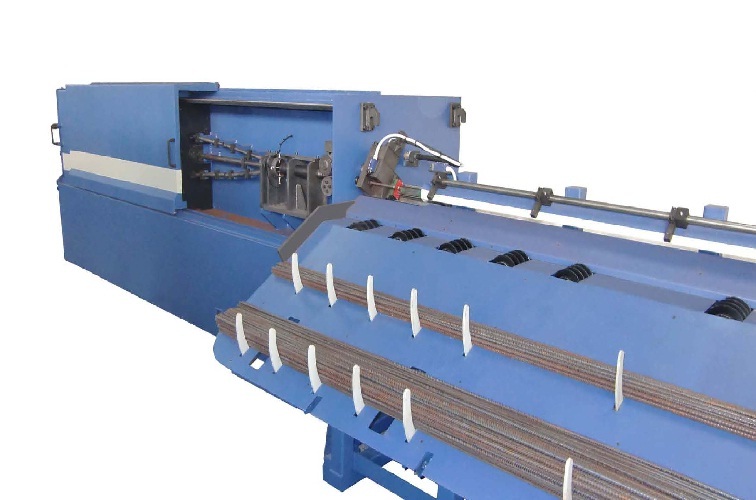 Depending on your preferred way of handling the straight and cut re-bars produced by the MELC straightening and cutting machine, our flexible storage and bundling solutions will effectively minimize or even eliminate labor costs and dead-times from your re-bar straightening & cutting operation. The automatic bundling machine is used together with a single line powered roller conveyor to produced perfect re-bar bundles for medium production straight and cut operations. In line with the bundling machine a laterally tilting conveyor can be used to store the bundles on a semi-automatic bin storage system. 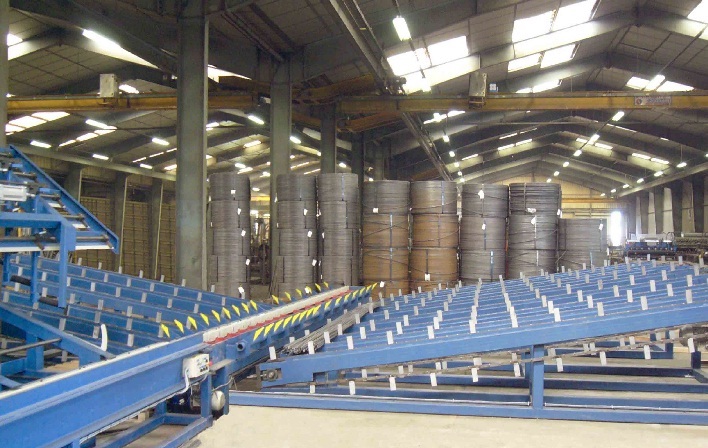 For higher production demands -especially for MELC multi-line machines equipped with more than three lines- a multi line powered roller conveyor is recommended together with a bundling vehicle: The bundling vehicle is automatically positioned in front of every conveyor to process and tie the re-bars into bundles. Each conveyor is equipped with an automatic aligning system, ensuring that all straight and cut pieces in every bundle are perfectly aligned before entering the bundling machine. 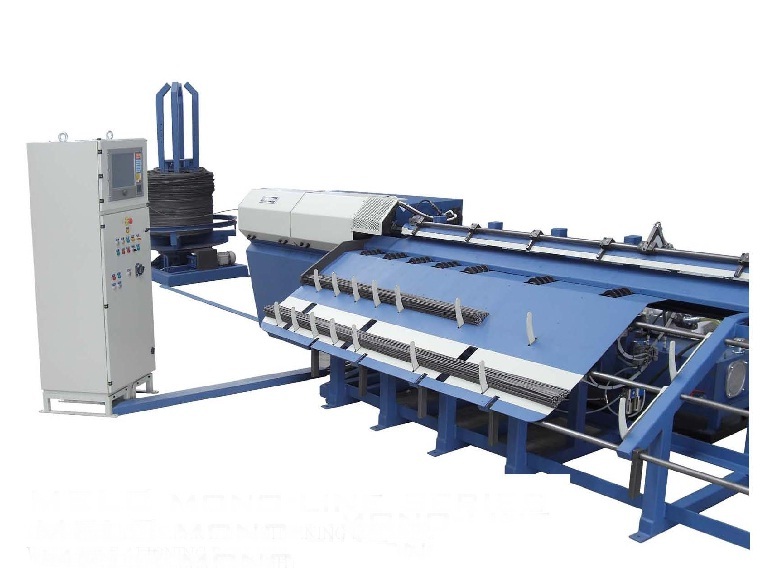 Regardless of the conveyor type selection, the bundling machine (which is fed directly from coil) is synchronized with the operation of the MELC machine and it is equipped with a tie-wire pay-off station and a two-plane roller straightening, feeding and cutting device. The number of ties per bundle as well as the number of turns per tie are programmable through the control panel of the machine. As the bundles are coming out of the bundling machine, a laterally shifting conveyor can discharge the re-bar bundles into a single or double direction pocket conveyor. Since the standards on the multi-line straightening and cutting operations are set with the MELC machines, EUROBEND GmbHonce again moves one step forward and combines the multi-line straightening and cutting principle with twin-head bending. 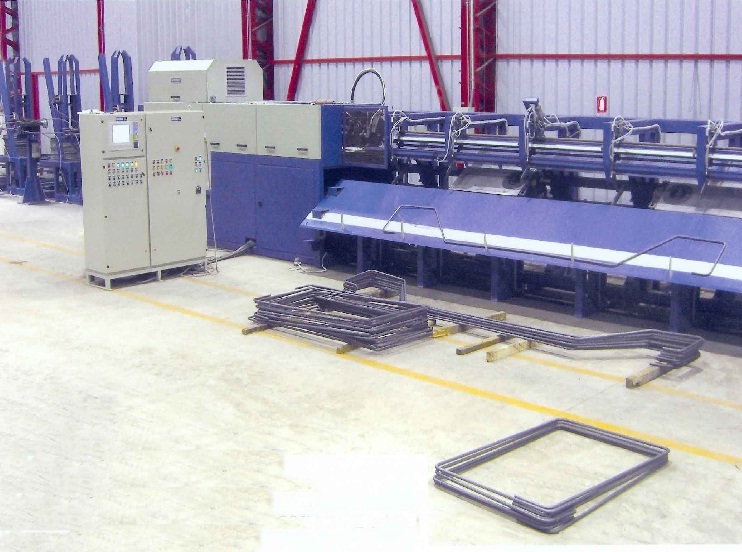 Two servo-driven bending heads are attached to the MELC straightening & cutting machine and in accordance with the production schedule the operator can straight and cut any diameter and/or make stirrups out of any line. Diameter changeovers as well as operation mode changes between the straightening machine and the bending stations are automatic and controlled via the computer using simple windows-based software. The bending heads feature automatic bending tool change (depending on the re-bar diameter processed) and automatic bidirectional bends.